Let GTE assist you in selecting the appropriate confetti or streamer shape, size, color and material in order to create your desired confetti or streamer effects. 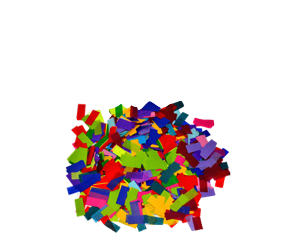 You can select from a wide variety of confetti shapes and colors. We also offer metal streamers, paper streamers and biodegradable streamers. We recommend using it in our 3″ or 6″ continuous flow confetti gerb.